What do you do? I work as the office manager at Emerge, an organization that offers an abuser education program, which is group counseling for perpetrators of partner abuse. I started working at Emerge because of my passion for social justice- my older sister started working with survivors of partner abuse several years ago. I’m drawn to organizations like Emerge that empower and uplift survivors and hold abusers accountable. Wow. That sounds intense. Are you from Boston originally? I’m from Burlington, MA. Do you have any style icons? My favorite gay and bi musicians; Frank Ocean, Hayley Kiyoko, and Olly Alexander from Years & Years. How would you describe your personal style? 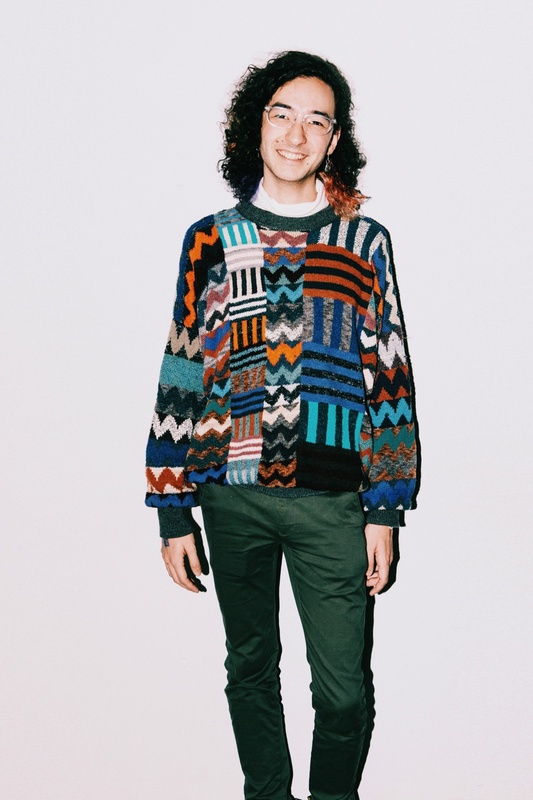 Fun, colorful, and androgynous. I love your sweater. The sweater! I got this years ago at Sister Thrift in Burlington for “Ugly Sweater Day’ in high school. I had no idea back then that I would wear it so often, but I love it! I love UNIQLO for new clothes and buy most of my pants there. Tops I get at thrift stores mostly! Tell me about what’s happening with your hair. I’ve been growing out my hair for about a year and a half now. I’m surprised how curly it is because I’m half-Japanese and nobody in my family has hair this curly. I got a “hidden rainbow” done, by Maddy Gersh at Salon Marcello in Lexington, so that I can show off the pride flag colors when I put it in a half-pony, but keep it more subtle when it’s down or tied back. What’s something else about you? I love to hula hoop! It’s my favorite way to dance.